This blog was created in 2003. It is hard to beleive that I was occasionally writing here for 11(!) years. I decided it is the time for a new start with a new name on a new blogging platform. I will be no longer updating this blog, but I welcome you to subscribe and read a new reincarnation of it, called λ-Files. Somebody should build a service for reverse auctions for a longer rides. Like Uber/Lyft but for 50+ miles. For example, last weekend I had to go from Saratoga,CA to Vacaville (~100 miles) to pick up a car there. The Uber quote was almost $200. I wish I can post this ride in advance and let Uber/Lift drivers to make bets on how much they would charge to drive me there. It is understandable for a driver from Saratoga to ask $200 for this ride - he will need to get back and not very likely to find a passenger for the return route. But somebody may be driving this way anyway and will be ready to drop me off for much less. 1. Use mobile phone accelerometer as an additional sensor to optimize motors' torque during turns. 2. Use mobile phone GPS. If you have a regular commute your board may know that you are approaching an intersection or a stop. It could also know in advance an elevation profile of your route and adjust accordingly. The same information could be used to more accurately estimate remaining battery. 3. Learning your individual riding style and adjusting acceleration/braking patterns to it. RasperryPI OS (Raspbian) comes with OpenCV 2.3. Many people experimenting with this platform want to use newer OpenCV version 2.4. It could be compiled on this platform but it is a laborious process requiring installing bunch of dependencies. The compilation takes about 10 hours and you need about 4Gb of disk space on your PI to do that. 0 upgraded, 43 newly installed, 0 to remove and 62 not upgraded. After this operation, 61.4 MB of additional disk space will be used. "Alex seems to be in the meeting with Joe for next 40 minutes. Are you sure you want to call him?" If somebody would write an app doing that I will be one happy user! 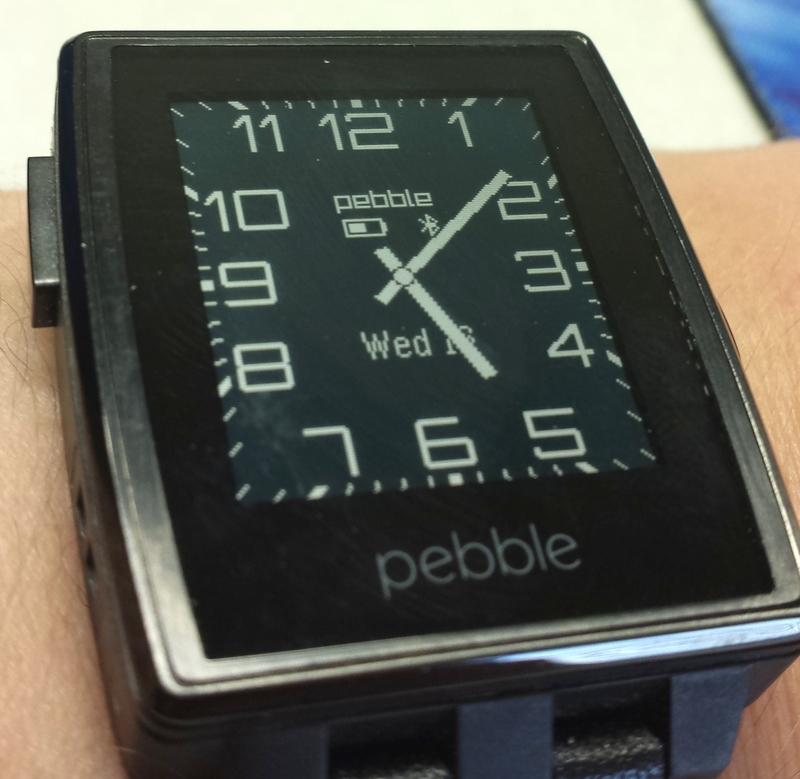 In pebble argot this is called "watchface." This is a particularly popular one and there are dozens of variations of it in the Pebble store. The problem shown is that sometimes date "window" (at least this is what it is called on mechanical watches) is obstructed by watch hands and you could not tell the date. There is nothing you can do about it in old style mechanical watch, but on Pebble you can, for example, move the date window position around to make it always visible. 1. Events. Example: business meeting at particular time and date. 2. TODO items: Example: Change oil in my car. 3. Tasks: Examples: Finish a paper by a conference submission deadline. Read a book before it is due back to the library. Most calendaring applications (Apple iCal, Google Calendar, etc.) support #1 and #2 pretty well. However I am yet to find one which have a good support for #3.
be able to gauge your progress and pace rate of your work. If you ever used project management software like Microsoft Project you can imagine what I am talking about. Ideally I would like to see something like simplified Gantt Chat. So I wish Google Calendar or RTM could add support for Tasks which progress tracking. I guess somebody could put together a simple web app using their APIs to visualize some TODO items as tasks. I will be glad to beta test. Over the years I contributed to many open source projects. As a rule whenever I write an utility or small hack for my private use I open source it, not matter how trivial, dirty or embarrassing the code might be. I used to maintain a list on my home page but frankly most of this stuff is obsolete and I have since removed it. When Source Forge was announced I eagerly moved my projects there. Unfortunately after a while SF development stagnated and I become increasingly annoyed by antique CVS and nineties-style web UI. Then came Google Code. It was simpler and cleaner, and Mercurial support sealed the deal for me and I started using it for all my new projects. Finally GitHub arrived and took over the open-source world. The last thing I wanted is another project hosting site, but it sucked me via network effects and I ended up using it for my newer projects. Some of you might have noticed that the new generation of mobile phone's touchscreen sensors offer some interesting new features. In particular, they could sense a finger or a tool before it touches the screen. Sony calls this the “Floating Touch” (video). Samsung calls it “AirView” (video). These capabilities open a door to many exiting new features, like 3D gestures and posture detection, for example as described in my paper. As a part of my research I have looked at how this works on Samsung Galaxy S4. First off let us clarify the terminology. It is tempting to refer to this as a "proximity" but this could be confused with proximity sensor in S4, so the term "hovering" is used instead. However in kernel source code sometimes these terms are mixed. From Java application one can subscribe to receive hovering events. On hardware level, Galaxy S4 touch sensing is powered by Synaptics sensor. It communicates with the driver using RMI protocol over I2C bus. The protocol version 4 is documented. However the specification is missing any information about hovering. Fortunately Synaptics have contributed an open source Linux driver which have hovering/proximity support (provided by undocumented function F51). writing 0x03 (ON) or 0x82 (OFF) values to /sys/class/input/event3/device/proximity_enables. What kind of information the driver gives us? As finger is approaching it starts reporting it coordinates and the distance. Additionally it reports estimated size of finger ellipse (as length of major and minor axis) using ABS_MT_WIDTH_MAJOR and ABS_MT_WIDTH_MINOR events. Finally, upon the contact, the driver reports contact area shape via ABS_MT_TOUCH_MAJOR and ABS_MT_TOUCH_MINOR. Additionally ABS_MT_ANGLE (0x3c) events are reported which supposed to report an angle of finger approach. More on these below. Some Galaxy S4 specifics: For approach events, only ABS_MT_WIDTH_MAJOR is sent. So we have to assume that the finger share is a circle, not an ellipse. Upon touch both axis length is reported. However ABS_MT_ORIENTATION events are never generated and we do not know how the touch area ellipse is oriented. I suspect that ABS_MT_ANGLE, a Samsung-specific event is used by them instead of ABS_MT_ORIENTATION , but this hypothesis needs to be tested. Additionally, the driver detects palm touch which is reported as ABS_MT_PALM (0x3d). This is just a quick overview post to share some technical information. I am still working on this and will post more as project progresses. I also want to announce that I have created a new blog, where I will be sharing links to various industry news about touch sensing, gestures, etc. I do not plan to write original material there - just links to relevant news from around the web. If you interested in gestures and touch user interfaces, please subscribe and follow. 2. Galaxy S4 can draw more current than HTC. 3. Samsung and iXCC chargers performed the best (about the same except iXCC has 2 ports you can use simultaneously).